This week a coordinated attack was launched on the HopeActChange.com community in an attempt to extinguish the message of hope, personal action and enacting positive change that was inspired by Barack Obama and made into an American mosaic through the efforts of thousands of citizens. The all-volunteer, Obama-inspired website was sabotaged by a small group of individuals who improperly flagged thousands of images that had been submitted by citizens across America, rendering roughly 20,000 family-oriented photos removed from view. 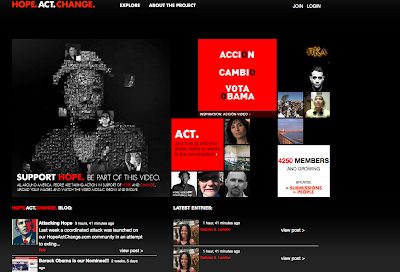 The images have since been restored to the HopeActChange.com website and their appearance within will.i.am’s Yes We Can video is once again fully functional. Despite this attack, the HopeActChange.com community will continue to remain entirely open and self-policing. The synchronized assault is a painful reminder that there will always be people who spend their time and energy trying to disrupt and dismantle inspiring movements of hope, action, and positive change. The HopeActChange.com collective invites you to join thousands of citizens across America in taking a stand against the cynics and troublemakers who have tried to bring down our community. Join us and make your voice heard. As Senator Obama has inspired us: "Nothing can stand in the way of millions of voices calling for change."